We’d love your help. Let us know what’s wrong with this preview of Whispers of Healing Oracle Cards by Angela Hartfield. Turn to this oracle whe The Whispers of Healing Oracle is here to help you nourish, strengthen and restore yourself to emotional, physical, and spiritual wellness. Whether you wish to heal a broken heart, resolve a work challenge or discover ways to fine-tune your beliefs and attitudes, this deck is ready to journey by your side as a source of support, guidance and insight. To ask other readers questions about Whispers of Healing Oracle Cards, please sign up. Beautiful art on the cards. Fifty in this pack, each as diverse as the last. 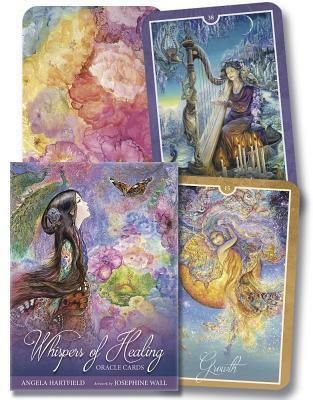 The 'Whispers of Healing Oracle Cards' by Angela Hartfield and Josephine Wall are about health and spirituality. Self-love and support as well. I admit to not having really used these yet (and healing oracle cards are not the same as tarot, apparently), but I already feel that they will have a calming effect on me (or maybe that's the perfume on the new deck). Ahead are some lifestyle changes, and finding new ways to look after my health, physically, emotionally and mentally. Most of all, I'll just remember to breathe and sleep; not so many late nights on the computer on a work day. Less stress and moodiness coming on my path. Balance and happiness might be around the corner, in time. The little instruction manual is loving and positive, explaining each magical, peaceful, fairy-like card. I was drawn to these particular cards, and did they choose me?